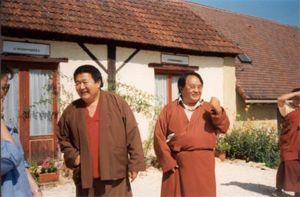 Laugeral, Urgyen Samyé Chöling, situated in the region of Dordorgne in France, is a Dharma centre established by Kyabje Dudjom Rinpoche in the 1970s. When he first visited Dordogne in 1972, Dudjom Rinpoche recognized the Vézère valley landscape as the one a dakini had shown him in a dream before his exile from Tibet. She prophesied that this would be a place where Dharma would flourish in the future. Dudjom Rinpoche founded the Urgyen Samyé Chöling association in 1977 and bought the centre and its attached residence in 1979. 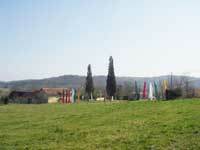 Dudjom passed into parinirvana at his residence, La Péchardie, in 1987. The centre is now under the spiritual direction of one of Dudjom Rinpoche's sons and spiritual heirs, Shenphen Dawa Rinpoche.